The uneven strips of cake would hardly make a pretty sight! Sigh! Thought let me not waste any more cream and might as well freeze the rest. But then, my son helpfully suggested that I pipe something on each piece. After a frantic search for the missing coupler, I finally cut the cake into small pieces, piped some cream onto them. 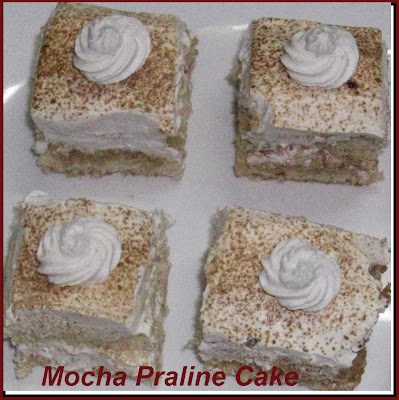 The cake would not win the best looking cake award, but would surely delight any coffee lover. It took the soaking syrup really well, making the cake moist without making it excessively so. Coffee.... what would we do without you??? Nice Blog... Good to see so many cake recipes, definitely an inspiration to me :) I'll surely be back to this site for more to come!